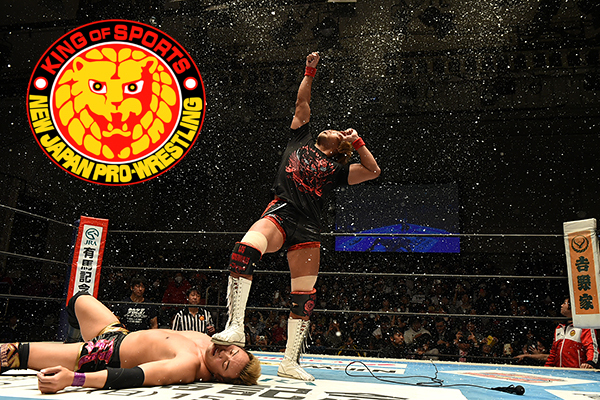 The show starts with a highlight reel of some of the best and most memorable moments from NJPW in 2017. Good match, and a good opener. These two went at each other right away, throwing strikes without much regard for their own protection. The pace was kept high with both men going from one hold to the next with little hesitation. It felt like they both really wanted to win and that they both wanted to make an impression. Umino somewhat dominated the match, but Narita showed some nice resilience, fight out of at least one submission. This was probably one of the better young lion matches I’ve seen lately. Like the opening match, both guys in this one seemed like they wanted to make an impression. The newly bald Yagi appeared to be the more determined of the two. Most of this match was fought on the mat, and Yagi eventually got the better of Oka in many of the holds they were exchanging. Oka wouldn’t go down without a fight though, and he built a nice comeback that led to the finish. This was short, but I liked it. Kawato went right after the much bigger Kitamura, catching him off guard a bit. But Kitamura’s strength was the star in this match. He overpowered Kawato repeatedly which played right into a nice finish. This was fest-paced and fun. Taichi went after Masked Horse’s mask right away, and Horse could never seem to keep his mask on throughout the entire match. Horse and his comedy seemed to be the focus of the match, and he was quite funny, but everyone contributed to making the whole match enjoyable. It was one of those tag matches where everyone kind of takes turns running into the ring and taking on someone then leaving and letting someone else have a turn. I liked it. Good match. Makabe and Yano started the match, but this turned into a fight between Henare and Ishii. Henare got some surprisingly good shots in and at least one very close near fall on Ishii. This whole match seemed to be focused on putting Henare over as a tough competitor, and I think it worked fairly well. It was fun to watch. Good match. Bullet Club did well early, but SANADA and EVIL had superior teamwork which helped them make a comeback that would lead to the finish. This was a solid match all around, though it did seem like a way to establish Los Ingoernables heading into Wrestle Kingdom. Good match. Everyone got involved, but this was really Kota Ibushi’s match. The crowd was fully behind him, and he took center stage a lot. This started as a brawl before the bell. The brawl continued for a while after the actual match started, then turned into a fight almost exclusively between Goto and Suzuki. Goto and Suzuki hit each other with some strong strikes and a few holds here and there. Iizuka wasn’t much of a factor in this match, and YOSHI-HASHI was even less of one. Still, I think this did a good job of setting up Suzuki versus Goto at Wrestle Kingdom as a hard-hitting affair. I’m looking forward to it. After the match, Suzuki gets on the mic and challenges Goto to make their title match a No-Second Hair vs Hair Death Match. Hiroshi Tanahashi heads to the ring with a new, curly hair style. He talks about returning to the ring in Tokyo Dome at Wrestle Kingdom. Jay White walks out to the ring and gets in Tanahashi’s face. White says Tanahashi’s time is over, and both men start to brawl. White gets the better of Tanahashi, hitting him repeatedly with elbows to the head. White finishes by hitting Tanahashi with a Blade Runner. Very good match. The focus of this was seeing Naito take on Okada, but everyone got involved in making this an exciting match. Los Ingobernables seemed to have the better teamwork which isn’t surprising. This was fast-paced with a lot of back and forth between the two teams. This was a very good main event for the night, and a nice way of continuing to build interest in Wrestle Kingdom. After the match, Naito invites Okada back into the ring. Naito holds out his hand to Okada, but it was a trick. Naito attacks Okada, hitting him with a low blow and Destino. The crowd at Korakuen Hall is solidly behind Naito as he declares that he will take the IWGP title at Tokyo Dome. This was an entertaining preview for Wrestle Kingdom. Even though lots of people who will be competing at Tokyo Dome weren’t at this show, NJPW did a good job of building interest with the people who were at Korakuen Hall tonight. There were no huge surprises except for maybe the appearance of Jay White (and Tanahashi’s hair), but this was a solid show with matches that got better throughout the night. Even though the IWGP Title match was the focus here, the action felt more evenly distributed among the competitors than some of the matches earlier in the night.